Senior secured floating rate loans offer a couple more advantages over the two more popular inflation hedges, commodities and TIPS. 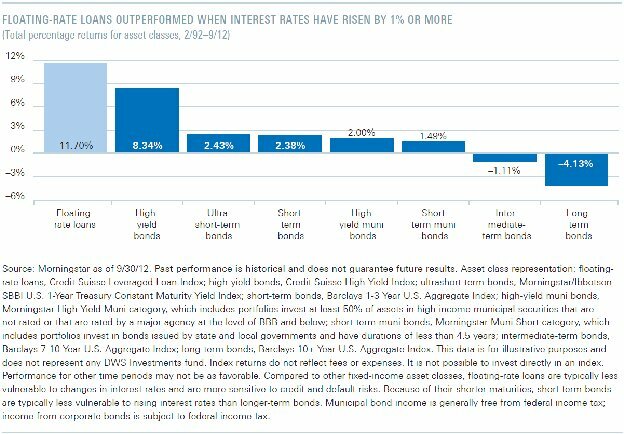 First, loan returns are historically less volatile than commodity returns and consequently investors have achieved better risk-adjusted performance with a 10-year Sharpe Ratio of 0.52 for the former versus 0.19 for the latter. Second, inflation will likely be accompanied by higher interest rates, which makes interest rate risk an important consideration. If interest rates rise, bond prices fall, and bond account values can lose significant value. 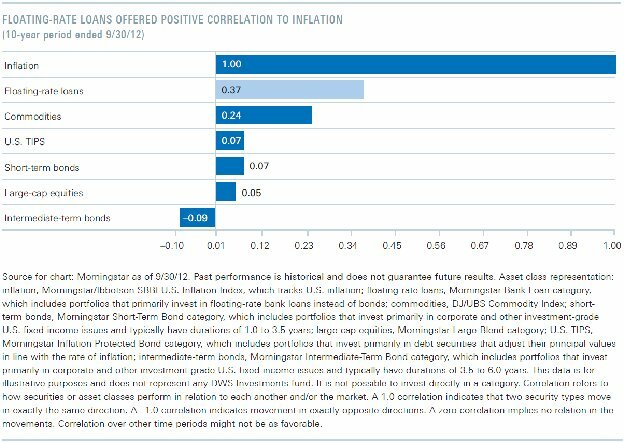 Interest rate risk, or sensitivity to changes in interest rates, is measured by what’s called duration. One potential advantage floating rate loans possess over bonds is that their interest rates adjust every 30 to 90 days consequently increasing if market rates rise. This feature keeps their duration very low, only about 0.2. By contrast, the duration of the Barclays U.S. TIPS Index is about 8.7, and therefore far more likely to sustain losses when interest rates rise. So in summary, if inflation flares up, you can get exposure to profits with less risk by investing in senior secured floating rate loans rather than commodities and TIPS. However, floating rate loans have their own particular risks that investors should discuss at length with their financial advisor. Of course, prudent portfolio management involves diversification, and in that pursuit senior secured loans should complement your other investments rather than be your only holding. Cory Burnell, CFA, is the Chief Investment Officer at BluePrint Wealth Partners< He holds the Chartered Financial Analyst (CFA) designation and is one of only 125 CFA Charterholders in California who advise individual investors. * Follow him online at www.coryburnell.com. *Source: 2/26/13, CFA Institute’s online membership database lists 6,396 CFAs in California, 125 of whom are financial advisors. The opinions voiced in this material are for general information only and are not intended to provide specific advice or recommendations for any individual. To determine which investment(s) may be appropriate for you, consult your financial advisor prior to investing. All performance referenced is historical and is no guarantee of future results. All indices are unmanaged and may not be invested into directly. Bank loans are loans issued by below investment-grade companies for short-term funding purposes with higher yield than short-term debt and involve risk.